Sai In My Breath: Why Sai Baba Took Mahasamadhi On Vijaya Dasami. Vijaya-Dasami means the triumph of good over evil, the triumph of righteousness over unrighteousness. The day Lord Rama killed Ravana and freed Sita from his clutches and this occasion is celebrated by the entire country. But the day of Vijaya-Dashami (also called Dussehra) is also very important for Shirdi Sai Baba and his devotees, because it was on 15th October 1918, Vijaya-Dashami day when Baba left his mortal coil. So, this day is venerated as the holy day that Sai Baba attained Mahasamadhi (Punyatithi) and is a big festival in Shirdi. In ancient times, the Kings used to perform the Ayudha Puja on Vijaya-Dashami day and then used to cross the frontier of their kingdom to fight against their rivals or neighboring kingdoms. Since then, every Vijaya-Dashami day, people in Maharashtra, cross the borders of their villages / places and return back. This ritual is called as "Seemolanghan". They then collect the leaves of Apta tree and exchange among their friends & relatives as gold. People also worship the Shami tree and its leaves. Sai Baba also used to take part in this "Seemolanghan" festivities with the villagers. Once, during the Dussehra of 1916 when the villagers returned back from the ritual of "Seemolanghan", they found Baba in a angry mood. Actually, during the ritual some people were trying to know whether Baba was a Hindu or a Muslim, and when Baba came to know about it, he got very angry. Taking off His Head-dress, Kafni and Langota etc. He tore them and threw them into the Dhuni before him. Everybody was trembling with fear and nobody dared to approach Baba. But then Bhagoji Shinde gathered courage and succeeded in tying a Langota round his waist and asked Baba as to what is all this? "Today is Seemolanghan", Baba striking the ground with his satka said, "This is my Seemolanghan” !!! By this incident, Baba gave an indication that in the future, Vijaya-Dashami was the right day for Him to cross the border of life. which the devotees could finally understand after two years on Dussehra 1918 only. In 1918, some time before Dussehra, Sai Baba prophesied to Ramchandra Patil that Tatya Patil was going to pass away on Vijaya-Dashami 1918. Tatya who used to refer Baba as his Uncle, was the son of Baijabai, a staunch devotee of Baba. Baba had decided to save Tatya life. On 28th September 1918 Baba got a slight attack of fever which lasted for a couple of days, but afterwards Baba gave up his food and thereby he grew weaker and weaker. And true to Baba's word, a few days before Vijaya Dasami1918, Tatya fell sick and was bed-ridden. Baba was also down with fever. Tatya's illness began to grow from bad to worse and he could not move at all but always remembered Baba. The predicament of Baba began to grow equally worse. As, Vijaya-Dashami dawned,Tatya's pulse began to beat very slow and he was expected to pass away shortly. But then a miracle happened. Tatya's death was averted and at about 02:30 p.m on 15th October 1918, Baba breathed his last. Thus on Vijaya-Dasami day itself, Baba crossed over his physical borders (Seemolanghan) and took Mahasamadhi. The Day also has significance as apart from Vijaya-Dashami, it also happened to be the Muslim month of Ramzan and a few minutes into Ekadasi (a significant lunar cycle in the Hindu calendar). Today due to Sai Baba's boundless grace, Shirdi has become a "Maha-Teerth" (Great Pilgrimage). 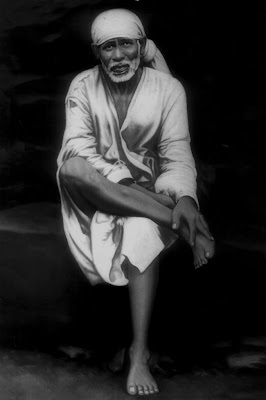 Who was Sai Baba or How was Sai Baba, no one truly knows but surely all have many stories narrating his glory. Around 1854, at the age of 16 yrs Baba came to Shirdi. He used to remain absorbed in Samadhi sitting under the neem tree and never met anyone during the Day while used to roam about fearlessly at Night. He never went to anyones Home. Heat and cold did not matter to him at all. The villagers who found him very Saint like, used to ask him as to who he was and from where he had come. After staying some time living in Shirdi, suddenly one day that child left Shirdi Village only to return several years later with Chand Patil's nephews wedding procession. Where the Khandoba temple priest Mahalsapati welcomed him by saying "Ya Sai". And since that day he was called as Sai Baba, who thus settled down in Shirdi permanently. Who was he, where was he born, who were his mother & father? These are some questions whose answers no one has nor did Baba reveal to anyone. Due to the miracles of Shirdi Sai Baba, his fame spread around. He has removed the sufferings of countless people. Who ever came to him has not returned in despair. To understand Baba correctly or to please him, his teachings need to be implemented. Baba was so kind and compassionate that even Cats & Dogs used to eat from his utensils freely. He used to say that to feed a hungry dog, was like offering food to him. Baba never gave discourses to his devotees. Who ever reads about Baba, gains knowledge by his teachings and becomes his devotee. To worship Baba, there are no rules or protocols as Baba is a slave to pure Love and Devotion only. Baba never advised anyone to leave their responsibilities or home and go to Temples or spend hours in worship. Simply keeping Baba in their Minds is equal to doing his worship. Those who have profound faith in Baba, used to feel close to Baba earlier also and do so today. Purer a Heart, Closer is Baba. As, a Pure Heart needs no miracles from Baba to believe in his existence. Thats why today Baba has devotees not only in India but also abroad in places like America, England, Australia, Canada, South Africa etc.